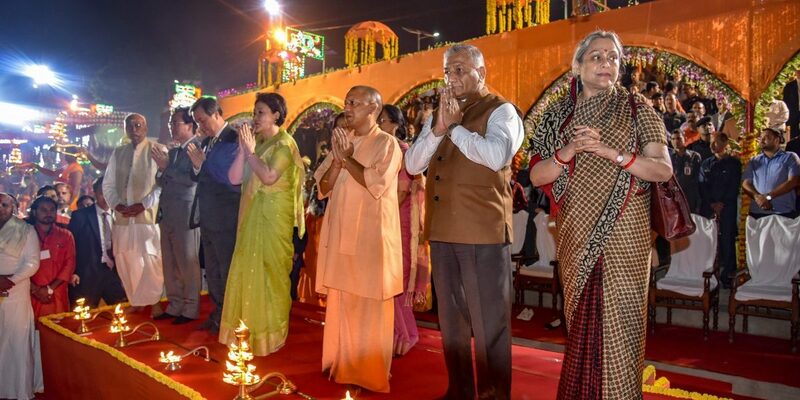 The Uttar Pradesh chief minister said Ayodhya would have a "scenic makeover" that would help recognise it as one of the best cities in the world. He announced that an airport will be named after Ram and a medical college after Dashrath. New Delhi: Confirming speculation that the UP government was planning to construct a statue of Ram would be built in Ayodhya, chief minister Adityanath on Wednesday said a few places had been identified as the possible locations for the “grand statue”. Coming days after announcing that the Faizabad district would be renamed to Ayodhya – the latest in a slew of areas that have been renamed by the state government, the chief minister also said there is “no doubt” about a Ram temple. “We all know that all Ayodhya has is this temple. People come here to worship Lord Ram and no one else. Mandir tha, mandir hai, aur mandir rahega. Isme koi sandeh kisi ko thode hi hai (There was a temple, there is a temple and there will always be one. No one doubts this),” he said, according to an Indian Express report. He also announced that the Ayodhya will have an airport named after Ram and a medical college after Ram’s father Dashrath. The announcements were made after Adityanath offered prayers at a makeshift Ram temple at the disputed site in Ayodhya. The government has planned a “scenic makeover to Ram Lalla” that would align with the demands of the people, he claimed. “We believe in the Constitutional system and we will solve this problem within Constitutional limits,” he added, according to the Indian Express. The “grand statue” of Ram will be “inside the temple”, Adityanath said, adding that Ayodhya’s identity is firmly linked to the deity. This announcement assumes significance as earlier this week, the head priest of the makeshift Ram temple at Ayodhya said a statue of Ram should not be in the temple and not in the open. “Different architects have suggested different things for the statue and we are working on it,” he said. The chief minister said he had visited two possible locations where the statue could be built. Claiming that the state and Central governments have announced several schemes for Ayodhya, Adityanath said he has surveyed areas where these schemes could be implemented. “Ayodhya will be presented as a great city to the world. Not just the areas in and around Ayodhya, we are also working for cleanliness of Sarayu,” he said, according to the Indian Express. After the Supreme Court refused to bring forward the hearing of Ayodhya title suit, several BJP and RSS leaders have claimed that the delay “hurts” Hindus. Adityanath himself had claimed that “justice delayed is justice denied“.